OK so it's not really a post for a Birthday... but this card from Denise got me in the Birthday spirit! I just love fun bright colors on a Birthday card and this one fits the bill! Gorgeous embossing and a great cupcake to finish it off! 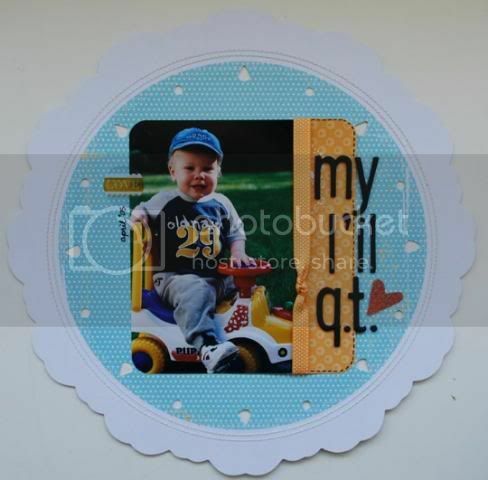 Today I wanted to highlight a layout from our newest Scrapshotz member... Laurel! The photo is amazing... 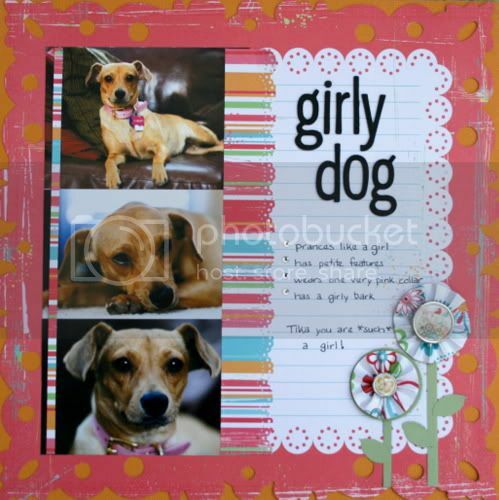 I love the colors and those inset photos are the perfect touch! Thanks for joining us Laurel... I hope we'll be seeing lots more of your work! I recently packed up some scrappy supplies to bring with me on vacation to scrap. I tried to choose items that I do not normally reach for, be it due to my laziness or poor memory, or both! Two of those said items are stickers, specifically alpha stickers, and rub-ons. I love both products but I just seem to forget to reach for them when I am in the midst of creating. And when the nearest scrappy store is 3+ hours away by car, I find myself finding new ways to use these scrappy staples. Firstly, I used some less than perfect pictures that captured our summer family vacation rituals, cropped out the distracting elements and then put them all together in a snappy collage. 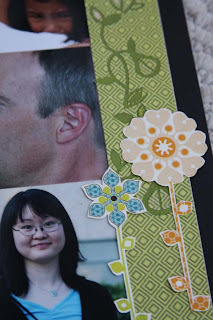 Then I used some leftover scraps of BasicGrey's Offbeat collection to frame my photo collage. At that point, it still seemed unfinished to me...and I still had the full BasicGrey Olio Book which matches the Offbeat collection. My first thought was to place a rub-on in an "empty" area on a photo. But divine intervention by my youngest took over! As I was getting a glass of iced tea, she decided to "help" me put on the rubs that I had cut out of the book. Well, if I'll be darned, I really liked that tone on tone look! It adds some interest and texture to the otherwise "neutral" paper. So I finished rubbing on the rest of the vines! 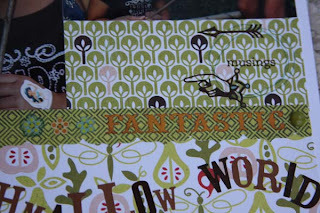 On top of the vines, I put some rubs on cream cardstock and fussy cut the images. These images were adhered ontop of the rub on vines. Below is a detailed look at this technique. 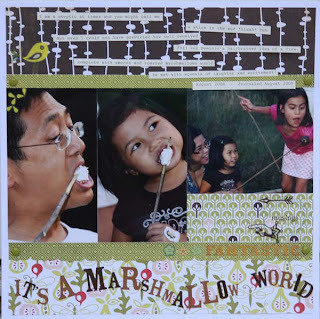 With my other layout, also using the Offbeat collection and shown below I layered rub-ons right on top of each other and I also grouped elements together. Here is a close-up of the layering and grouping; there are 7 rub-ons used. I hope you will give these techniques a try and if you have tips to share, please post them here! August and summer is in full swing!!! And Scrap Shotz is in full swing too. The Summer CHA show just finished and we're all waiting excitingly for all the new goodies to come into the store. I'm sure Sandy has lots of new stuff on the way. Make sure you check back often to make sure you don't miss a thing. Also, Tuesday August 4th is 10% Tuesday. Help Scrap Shotz clear the shelves to make room for all the new CHA arrivals. Just use the code "tuesday10" and receive 10% off almost all regular priced items all day. Let's not forget, today is Reveal Day too!!! 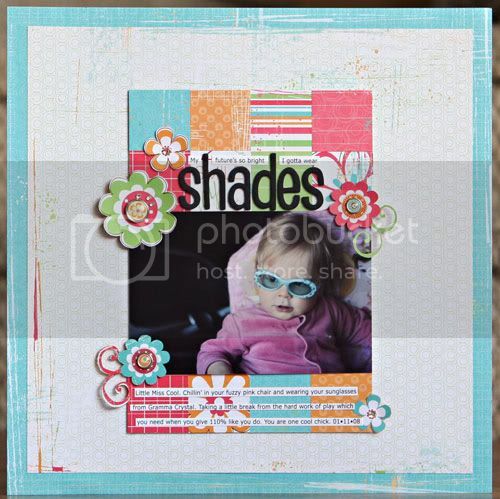 The August Kit is "Rockin' Summer Spirit" and is just perfect for those summer photos. This kit is really special for us. It features a brand new company for us, all the way from Australia called Ruby Rock-it. Their "Kindred Spirit" line features beautiful cheery colours with lots of versatility. This kit really ROCKS!!! Here is some of the Rockin' layouts and projects that our fabulous Creative Team created with this beautiful kit. Make sure you check out the Scrap Shotz Gallery for the full reveal.